The game of Arkanoid is divided into 33 stages. The first 32 stages are composed of a variety of layouts of bricks. 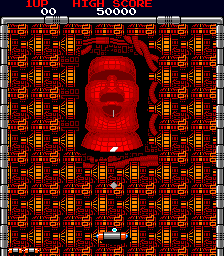 The final 33rd stage is a confrontation between the Vaus and the physical manifestation of the enemy known only as "DOH" who resembles a large head of a Moai statue from Easter Island. Extra lives are typically awarded at 20,000 points, again at 60,000 points, and every 60,000 points thereafter. The arcade game permits players to continue from the most recent stage after their game has ended if more credits are entered within a time limit with the sole exception of the final stage. After successfully clearing 32 stages, you will have the opportunity to use your remaining lives to defeat the enemy DOH. If you do not succeed in defeating DOH before the game is over, you will not be permitted to continue and try again. You must hit DOH with the ball 16 times. As you try, DOH spits projectiles from his mouth that are deadly to the Vaus. If one of them strikes the Vaus, it will explode, so they must be avoided at all costs while preventing the ball from ever slipping below the Vaus. If you succeed, you will be presented with the ending to the game. This page was last edited on 2 June 2016, at 13:33.